MacBeki is strictly protected by copyright. **** MacBeki has to be [Uys's] most ambitious foray into the body politic yet. ... a wily comedy, a political satire, a compelling tragedy, rolled into one. Uys takes his wit and humour to a new and truly fabulous level. ... MacBeki is satirical social commentary at its best. MacBeki uses Shakespearean references, urban legends, rumour and poetic licence in a sweeping Machiavellian ("MacBekivellian" to Uys) narrative about the lust for power and the ruin it brings the protagonist. MacBeki sparkles and fizzes with Uys’ particular satirical genius. This is the first theatrical rendering in 15 years that directly confronts and exposes those who would wield enormous power over our lives. And all this in an election year. The relief at seeing these "remote" figures pilloried and exposed in such a hilarious fashion is cathartic and downright good for democracy. With MacBeki, Uys draws together the many strands that contribute to his singular status as one of the most important, influential and versatile public voices in the country. In MACBEKI , playwright and satirist Pieter-Dirk Uys has dug deeply, searching Shakespeare’s play to find hidden riches, seams to explore, small, shocking ideas and tiny secrets that reveal or give away an enormous amount about our own political predicaments. ... When he messes about with the text, there is the immediate excitement of contrasting energies; and, as the characters move from one intense emotion to another, all manner of unexpected things are released. Uys’s unstuffy approach creates a broad, pantomimic atmosphere, filled with breezy confidence and irreverent gusto. Everything is artfully arranged to give plenty of laughs and the show has the pulse of real life. Ingenuity such as this is a real tonic among the alarms and excursions of SA today. 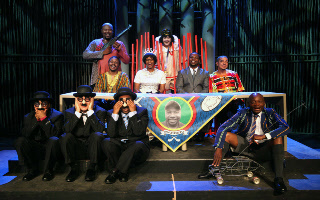 Uys’s Shakespearean-inspired script airs the country’s dirty laundry with glee, laughing at the hypocrisy and chiding the inadequacies. When it’s not eliciting a giggle, or a gasp of shock, Uys’s dialogue is extremely hard-hitting. Kudos to Uys and his cast for providing some sobering perspectives just ahead of the elections. Sometimes political situations in this wonderful country of ours really do play out like dramatic Shakespearean plays with twists and turns, betrayals and love affairs and in the end it all turns out to be a bit of a joke. Pieter-Dirk Uys has done just this with MacBeki, making the current South African political divisions hilariously funny using Shakepeare's famous tragedy, "MacBeth" as the scene and setting. The plot however is thicker than Shakespeare could ever have imagined. Congratulations to Mr Uys, it's a true South African beauty.